Working in industry for a year has allowed me to become more independent as a designer, and given me the skills required to make the most of my final year. “I enjoy the design process. Researching, sketching, and putting together a design for a project is a process I enjoy, and making models of a final design. “We had the opportunity to go to Barcelona in second year to look at Mies Van Der Rohe’s Barcelona Pavilion, the Olympic Park, and also saw Gaudi’s Sagrada Familia in its final phase of construction, as well as his other buildings throughout the city. We were recommended places to visit and walking through the city and discovering them was all part of the trip. “We’ve also been to Yorkshire Sculpture Park, the Hepworth Gallery in Wakefield, and had a residential trip to Bristol in our final year. The trips are really important as they allow you to get out of the studio and experience spaces for ourselves rather than just relying on a computer screen. “I worked at Leonard Design Architects in Nottingham with the Interiors team. I got to work on projects in countries all over the world including Poland, Korea, Denmark, and of course the UK – with projects in Nottingham and London. I primarily helped on retail projects, working on stages varying from concept to scheme design and in one case I got to see a project right through from concept to construction, and it is now on site. “My responsibilities were varied - from drawing plans and sections, to specifying materials and finishes, to working on concept proposals, sketching, Photoshop, doing technical detail drawings, and putting presentations together. Although I worked with the interiors I got experience in the architectural side of things too, including drawing up a masterplan. What skills have you gained on your placement? 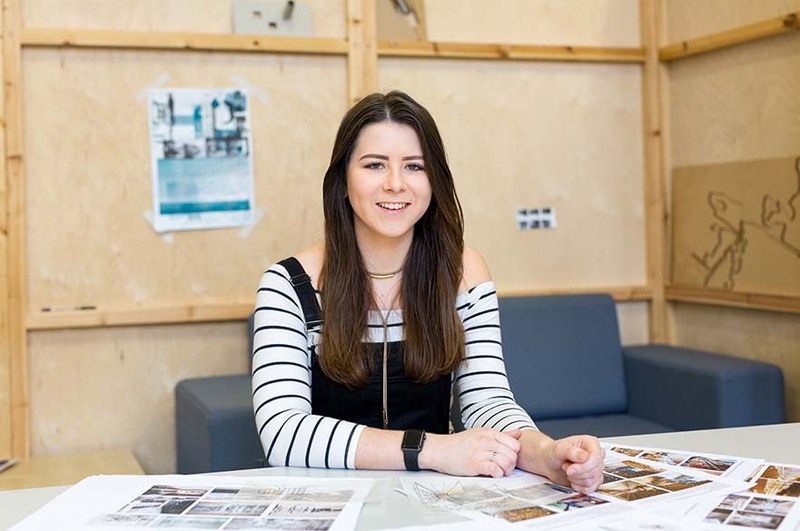 “I learned a lot more about design itself and its practice in the ‘real world’ – putting the skills we have learned on the course into practice on live projects was an invaluable experience which has given me a step up in my final year, and a confidence in my abilities that I otherwise wouldn’t have had. I’ve also gained experience in communicating with people, and having one-to-one meetings with suppliers has also improved my confidence.